Home > Comet Clutches and Parts > Comet 219563A (202427A) Drum for 1” Bore 20/30 Series Comet Industries Drive Clutch. > Comet 219560A Drive Clutch. 1" Bore. Comet Industries 219560-A Driver for 20 series. > Comet 219461A Driven Clutch. 7" Dia. 5/8" Bore. Comet Industries Lower Pulley. Comet 219461A Driven Clutch. 7" Dia. 5/8" Bore. Comet Industries Lower Pulley. Comet 219461-A Driven Clutch. 7" Dia. 5/8" Bore. Genuine Comet Industries Part 219-461A (Lower Pulley) -- NOT a "Chinese Copy"or "Clone". MADE IN USA!. 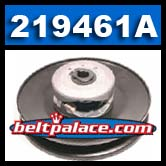 Replaces Comet 219461A, Comet 217774A (discontinued). Comet 215699A "Green" Torq-a-Verter2, 30 Series Spring. Manco 6805. Comet 215699A "Green" Torq-a-Verter Spring for Driven Clutch (Axle, not Motor). Replaces MANCO 6805. Part# 16 on Comet assembly diagram.